"HORNET IN BATTLE FOR LEYETE GULF"
ON OCTOBER 20th, the Hornet helped protect the Army landings in Leyte Gulf and four days later joined the other fleet units in beating off the three-pronged attack of the Japanese Fleet, achieving one of the greatest Naval victories of all time. "Today will be a Field Day! Air Department, dust off all overheads, removing any snoopers which may be adrift and sweep out all corners of the Philippines, sending to incinerator or throwing over the side (first punching hole in bottom) any Nip cans, AP's or AK's still on topside. Gunnery Department, assist as necessary. Engineering, continue to pour on the coal. Medicos stand by with heat-rash lotion. Damage Control, observe holiday routine." When the task force was attacked by more than 500 enemy planes during a single day of the Battle of the Philippine Sea, the Hornet's planes accounted for fifty-two of them. And during this battle the Hornet's planes bagged the biggest prize of the battle, a big Shokaku class carrier sunk by their heavy bombs. They hit a Jap cruiser and another carrier. All but one bomber crew returned. By that time the carrier was credited with eleven ships sunk, seven probably sunk and sixty-five damaged. During the months which followed, the Hornet ranged through the Philippines, supporting landings, attacking enemy installations and on several occasions turning back Jap convoys trying to reinforce their Philippine garrisons. She took time off for a scouting trip north-getting aerial photographs of Okinawa for subsequent use. In fourteen months of action she cut a twisting, 150,000-mile swath of destruction through the Pacific-leaving about 1,270,000 tons of enemy shipping sunk or damaged and 1,410 ruined enemy planes in her wake. But the Japs didn't touch her. The Hornet eighth of her name in the history of the Navy, and named particularly for the ship from which General James H. Doolittle launched the initial Tokyo bombing raid- came home for an overhaul, to repair typhoon damage and to give her 2,500 weary crew members a rest. There are those who say the Hornet would have continued hammering the Japanese 'till the end of the war if it hadn't been for the typhoon of June 5, 1945. She had been through one typhoon down in the Philippines, but it didn't compare to this one. Catching the Hornet 150 miles east of Okinawa at 2:00 a.m., the gale bounced the 27,000-ton ship about like a chip. Suddenly her bow rose atop a tremendous wave and crashed downward with such force that the forward corners of the flight deck folded down along her sides. After that the engines were stopped and the ship drifted before the wind like a sailboat. The next morning the Hornet, unable to launch her planes in the normal manner, backed into the wind in order to get search planes off the deck. 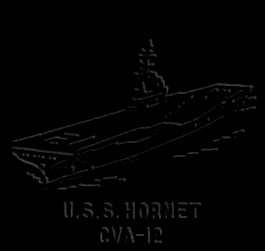 They aided in reassembling the task force, returned to their ship and, at last, the Hornet retired from the battle area. The Hornet had worked hard. As part of famed Task Force 58 and flagship of Rear Admiral J. J.Clark, USN known affectionately throughout the Fleet as "Jocko" she hammered the Japs in every major action from the March, 1944, strikes on the Palau Islands through the Okinawa operations. She's had three skippers, mothered three air groups and helped sink a battleship. But it took a 120-knot gale and a mountainous wave to send her back to the States. She struck the first blow for the liberation of the Philippines. She was the first to hit Tokyo in a full-scale carrier-air attack. She was first to hit the Yamato, 45,000-ton pride of the Jap Fleet, which now rests on the bottom of the East China Sea. She attacked the Jap Fleet anchored in its homeland bases. She set what is believed to be a record for airborne enemy planes by a carrier in a thirtyday period: 255 between March 18th and April 16th. She accounted for sixty-seven Jap planes in a single day's operation. She spent a total of fifty-two days under Jap air attack without being hit by as much as a machine gun bullet. Besides all this, the Hornet did dozens of lesser chores. Dubbed the "Hornet Hotel," she served as troop transport for thousands of Marines; auxiliary tanker to hundreds of destroyers; prison ship with accommodations for 130 Japs; drug store for friendly delivery of ice cream and other "goodies" to lesser craft; gymnasium, recreation hall, fight arena and baseball stadium for her crew, some members of which didn't leave her decks for fifteen months. Launched by us on August 30, 1943, no aircraft carrier in the history of the Navy ever made ready so quickly or had such a short shake-down cruise. Precisely seven months after she was launched the Hornet saw action in the Pacific war. Under Captain Miles R. Browning, USN, the ship joined Task Force 58 March 20, 1944, and ten days later was striking at Palau. Shortly afterwards she supported landings at Hollandia, New Guinea, made a stab at Truk and others at Satawan and Ponape. From then on she rode the wave of Navy carrier air activity which brought her eventually to the shores of the Japanese home islands. Six months after commissioning, Rear Admiral (then Captain) William D. Sample, USN, relieved Captain Browning and under his command the ship went into the Marianas operation, a two-month deal which took the Hornet from Guam to the Bonins and Volcanos, through the Battle of the Philippine Sea, to Pagan and the Bonins again, to Eniwetok Atoll and back to the Bonins for the third time. She supported the Guam invasion and during that time her planes carried out the longest carrier-air strike against enemy shipping on record-then hit Yap, Ulithi and, for the fourth time, the Bonins. So frequent were Rear Admiral Clark's attacks on the Bonins that a "Jocko Jima Development Corporation" was formed aboard the Hornet for the purpose of "developing and selling shares in real estate within 500 miles of downtown Tokyo." During this period more than 3,000 sorties were flown off the Hornet and the ship's air group shot down an unprecedented number of airborne enemy planes, 233 of all types, with a day's high of sixty-seven during the second visit to the Bonins June 24th. After the Marianas operation was concluded, Captain Sample was appointed Rear Admiral and was relieved as the Hornet's skipper by Captain Austin K. Doyle, USN, who took her through her subsequent campaigns and brought her safely home. In September, 1944, the Hornet moved into the Philippines and conducted strikes against Davao, Mindanao, Cebu and Negros Islands. On September 21st she steamed up the coast of Luzon and launched the first attack on enemy shipping, installations and air fields in and around Manila Bay. In October the ship attacked Okinawa, sinking three ships and damaging ten others and destroying twenty-seven planes. Then she moved in on Formosa where she experienced the heaviest air attacks of her career. But she and others of the group concluded the operation without loss despite Jap radio claims of "Eleven American carriers, two battleships and three cruisers sunk." In early February, the Hornet moved to keep a date made for her thirty-four months before by another Hornet, also built by us. In the pre-dawn hours of February 16th, her planes were launched and joined wave after wave of aircraft from other carriers for the first full-scale aerial attack on Tokyo. For two days she steamed 200 miles from the coast of Honshu, unchallenged and unmolested, while her planes shuttled back and forth through heavy overcast and foul weather to carry explosives to the Japs' front yard. Later in February the ship supported landings on Iwo Jima, then back to Tokyo for another devastating raid, and finally a return to an advance base for recreation and replenishment, hitting Okinawa again en route the third visit in five months. On March 19th, the ship was off the Japanese home islands again, this time in a daring raid on enemy warships at anchor at Kure and Kobe carried out by planes while the ship cruised about within forty miles of the Shikoku shoreline. On Easter Sunday, the Hornet was off Okinawa again, this time to support invasion of the island. Her officers and crew expected a violent Jap reaction to the invasion. On April 6th and 7th they got it. More than 500 planes of all types swept down upon Rear Admiral Clark's group. When the smoke cleared, the group had accounted for 152 of them and of that number more than a third were credited to the Hornet's battle score. Early in the morning of April 7th, Navy search planes far to the north reported an enemy task force, including the heaviest warship of the Jap Fleet, was headed into the East China Sea. The American task force raced northward at top speed and launched its planes at noon. First to arrive over the target, the Hornet's pilots recognized and attacked the 45,000-ton Yamato, the Japs biggest battleship They scored four torpedo hits and three bomb hits on the dreadnaught, which was sunk. Then they proceeded to slam bombs into two cruisers and four destroyers of the enemy force. The month was one of intense activity. The ship's fighters and bombers ranged the length of the Ryukyu chain and up into the home island of Kyushu. On April 14th her flyers downed two Jap twin-engined planes carrying Baka rocket bombs and their suicide pilots. The following day the ship was at General Quarters continually as Jap air attacks were beaten off. On April 16 the ship and her planes downed fifty-four Jap planes. Finally, on April 17th, the ship turned toward its advance base. For forty days, beginning March 18th when she repelled the first enemy attack off Kyushu, the Hornet had been in almost continuous action against the enemy. She had launched attacks on thirty-two of those days and had been attacked on 105 occasions during that period. The flyers flew more than 4,000 sorties, the antiaircraft gunners fired more rounds than they had during the entire previous year, and the ship was at sea longer without dropping anchor than at any other time in her history. But she was up and at them again May 13th, this time destroying a huge new Jap aircraft factory on the home island of Kyushu before it had time to manufacture a plane. Then, on June 5th, came the 120-knot gale and a mountainous wave that resulted in the Hornet retiring from the battle area and heading back to San Francisco, California. She steamed through the Golden Gate July 7th, unloaded her unexpended ammunition and planes, dropped her air department and put into the Naval Drydocks for repairs. Marked on her island is the following score: 668 planes shot down; 742 planes destroyed on ground; 1 cruiser sunk; 1 carrier sunk; 10 destroyers sunk; 42 cargo ships sunk; 1 assist on battleship Yamato.